Chapped lips are one of the most irritating and regular inconveniences that we face and rarely do we stock up on the remedies because lip balms just happen to be easily forgotten. Particularly when they are at their worst; during the winter, we focus on packing our gloves, hats and scarves and forget the smaller remedies in life. Help with some personalised ointment of allbranded to provide enough vitamins and oils for the lips of your target audience to give them back a smooth feel. allbranded is your provider of promotional lip balms that can be used as promotional products so they to catch the eyes and will most certainly be forgotten alongside all the winter wear. Print your products individually with your logo and choose the right product from a huge colour palette, including our highly-recommended pens, mugs and eco-friendly bags! The regular usage, particularly during the colder seasons will not only appeal to the user but also anyone around who is looking for a flashy, suitable and effective ointment for long-term protection! 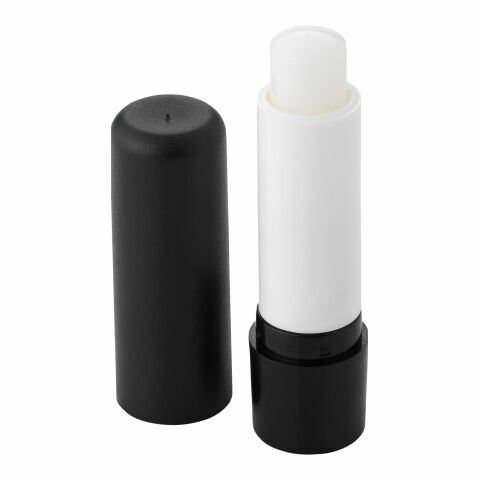 Logo printed lip balm is one of the most popular products in our promotional costmetic products range, orders yours now! This product is to protect the skin of outside influences and make for highly popular and effective remedies for these short-term conditions. They are small, compact and easily stored and thus the right promo article for your company. Whether you choose to give them away at fashion shows, in cosmetic schools, fairs or other events, you will have a long-lasting advertising effect on men and women. Print your promotional lip balm with your logo or slogan and let dry lips be a part of the past. Thanks to their daily use, your target audience will always keep you in mind. Lip balm products in the allbranded online store are clean of paraffin, mineral oils, waxes and added preservatives, but they are full of vitamin e and high quality shea butter in order to provide the lips with moisture and to work in a replenishing way. After the application, a shining glow will therefore remain on the lips and for extra measure, our range includes different forms of appliance including pencil or in form of tin. If you are looking to commit to a gift back consider our range of desk accessories and more including but not limited to branded keyrings, pens, pencils, mugs, eco-friendly bags, umbrellas, folders, usb-sticks, holders and clocks. These make for ideal giveaways. They are cheap to produce and fit in every bag due to their compact size and portability. They are perfect for young and old as well as men and women. During the summer, our range of promotional lip balm offers protection against harmful uv-rays with SPF 20 but don't worry, we have also got you set for the colder seasons when you suffer from chronic chapped lips (as we all have). Consumers will love this promotional product, even more so if you give them away with promotional candles to! For non-seasonal products check out our printed eco-friendly bags, pens and mugs! Our balms however, with their soothing effect and different flavours, these are a very popular promotional product and make for a unique memory, so your company will be associated with the product in a positive way. Pharmacists often offer these as add-ons during the winter, printed with their logo and address for immediate medical advice. As do hotel chains often giveaway small tins of lip balm that will remind the user of their travels and the hotel itself. Make a luxury wellness gift set by combining logo printed lip balms, candles & promotional dressing gowns. This will ensure that your customers, employees, business partners or target audience get a chance to relax and reflect on your brand. People can't help but think favourably about a business that gives such high quality and luxourious gifts away to those they interact with! In the online store of allbranded, companies can find a huge variety of cheap personalised lip products that can be customised in a fast and easy manner. The outer packaging is printed with the silkscreen or pad printing technique, depending on the material and form. With a lip balm tin in your corporate look your advertising medium will be a real eye catcher and your marketing campaign a total success. Call us for personal advice or just order immediately online. allbranded is your professional partner for nurturing advertising products with a high user value such as our popular collections of branded Keyrings, pens, pencils, mugs, eco-friendly bags, umbrellas, folders, usb-sticks, lanyards, holders, torches, clocks and other desk accessories!